Fraud was largely seen as a broad legal concept prior to Companies Act, 2013. Even though Our country has witnessed several Corporate frauds, few of them being – the 5,000 crore rupees Harshad Mehta scam in 1992, 7,000 Crore rupees Satyam fiasco in 2009, the 27,000 crore rupees Sahara fraud case which started in 2010 & is sub-judice in supreme court, till date. The Central Government seeks the support of auditors in bringing transparency & discipline in the corporate world to protect the interests of the shareholders & public at large. So, new Act has come with more specific & clear provisions relating to fraud & fraud reporting. Therefore, auditor shall consider the requirements of SAs for assessing risk of fraud. d) Abuse of position committed by any person or other person with the convenience in any manner – with intent to deceive or to gain undue advantage or to injure the interests of company or shareholders or creditors or any other person. 1. While providing Attest or Non-Attest services, Auditor may became aware of a fraud that is being or has been committed in the company by its officers or employees, which auditor uses or intends to use the information obtained, then in such cases, the matter may become reportable under Sec.143 (12). b. If additional procedures have not performed within 45days of request, auditor needs to evaluate if he should report to Central Government. b. A foreign corporate component or a component that is not a company. 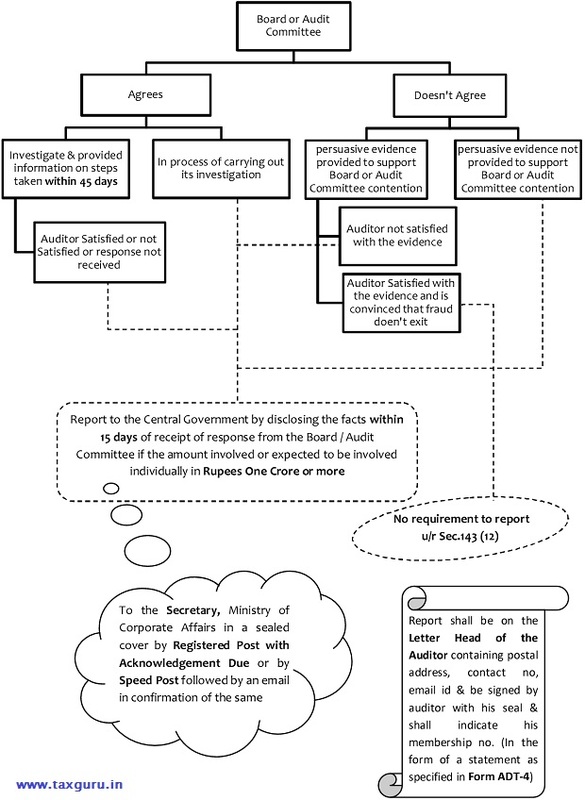 However, the auditor of the parent company in India will be required to report in the components of the parent company, if the suspected offence of fraud in the component is being or has been committed by employees or officers of the parent company and if such suspected offence involving fraud in the component is against the parent company. 4. Fraud relates to periods prior to coming to effect of the 2013 Act – Sec.143 (12) will arise only if the suspected offence involving fraud is identified during the financial years beginning on or after 1st April, 14 & to the extent that the same was not dealt with in prior financial years either in financial statements or in the audit report or in boards report under the companies act, 1956. ‘Suspicion’ is a state of mind more definite than speculation, but falls short of knowledge based on evidence. It must be based on some evidence, even if that evidence is tentative – simple speculation that a person may be engaged in fraud is not sufficient grounds to form a suspicion. Rule 13 of the Companies (Audit and Auditors) Rules, 2014, as amended by the Companies (Audit and Auditors) Amendment Rules, 2015, has used the terms ‘reason to believe’ and ‘knowledge’ (of fraud). The condition of ‘reason to believe’ would be met if on evaluation of all the available information with the auditor and applying appropriate level of professional skepticism the auditor concludes that a fraud is being or has been committed in the company. Having ‘knowledge’ means knowing ‘that’ something. Whilst Section 143(12) uses the term ‘offence involving fraud’ and the Form ADT–4 uses the term “suspected offence involving fraud”. As per paragraph 3 of SA 240, although the auditor may suspect or, in rare cases, identify the occurrence of fraud, the auditor does not make legal determinations of whether fraud has actually occurred. Determination of “offence” is legal determination and accordingly, the auditor will not be able to determine whether under legal parlance an “offence or suspected offence involving fraud” has been or is being committed against the company by its officers or employees.